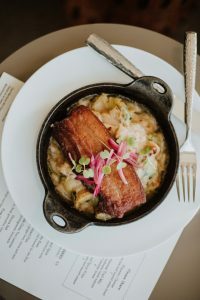 Spend quality time with your sweetie this Valentine’s Day with a romantic five-course dinner lovingly prepared by James Beard Nominee Finalist executive chef Matthew McClure. You’ll swoon over special dishes like Pan Roasted Coho Salmon and Smokey Beef Tenderloin. Two seatings will be offered at 5-7pm and 8-10pm. Table d’hôte menu available, five courses for $65-$79 per person. Looking to celebrate all weekend? We’ll continue the romance with specials available in addition to our regular menu 02.15-02.16. Make a night of it. Skip going home after dinner and retreat to 21c Bentonville.